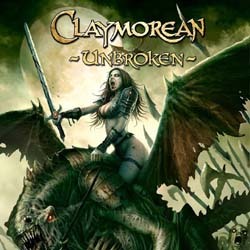 Serbian epic power metallers Claymorean from Lazarevac are working on their third full-length album, entitled “Unbroken“. The band was formed as Claymore in 1994 by its original member Vlad Invictus. Thy released two albums under the name Claymore, “The First Dawn of Sorrow” in 2003 and “Lament of Victory” 10 years later, in 2013 via SoundAge Productions. In 2014, the band changed its name into Claymorean. Their music can be described as mix of traditional European power metal with epic film-score influences. The recording of “Unbroken” will begin in October 2014 at Midnight Studio, as the previous album “Lament of Victory“. Claymorean have already unveiled the front cover of their upcoming album, which is just a part of a magnificent picture drawn by famous artist Dušan Marković. For now, the band has released a free demo material from the upcoming album that you can listen in its entirety in their official Bandcamp page. The full-length album will include 2 more instrumental compositions and one new song, 11 tracks in total.